Is there a web resource where I can learn more about Antony's Legionary denarii? How many legions did he command or mint coins for? Are some more desirable than others based on the history of the legion? I'm in negotiations to buy a denarius of the Fourth legion. Any interesting history about that legion? David Sear states that twenty-three legions (LEG PR1 to LEG XXIII) were honored on Antony's Denarii. The Praetorian Chorts & "Cohort of Speculatores" were also honored. According to Sear LEG PRI is a "great rarity". Source Roman Coins and Their Values – The Millennium Edition – Volume One – Page 284. Legio IV Scythica was levied by Mark Antony around 42 BC, for his campaign against the Parthian Empire, hence its other cognomen, Parthica. The legion was still active in Syria in the early 5th century. The legion's symbol was a capricorn. In its first years, the whereabouts of IV Scythica are uncertain, although it is probable that it took part in Antony's campaign against the Parthians. The name suggests that it fought against the Scythians. After the battle of Actium and Antony's suicide, Octavian transferred IIII Scythica to the Danube province of Moesia. The legion is reported to have taken part in civilian tasks, such as the building and keeping of roads. In his youth, future emperor Vespasian served in this legion. The Praetorian Cohorts and the Speculatores types are a little scarce. Most people know that XXIII is a tough legion to get. It is less well known that XVIIII (long form of 19) is genuinely rare. XIX is of course common. And pictured in the screen-shot below (apologies for the poor quality, it is literally a screen shot - I will make up a better version in time). Andrew, thanks for the information and the URL’s. and your information makes my new specimen even more enjoyable. Specimen counts from large hoards are usually very good indices of relative rarity. IIX not in Crawford, none in hoard. Andrew, how do we know of this piece? So the real rarities are PRI, IIII (Andrew, why not in your list? ), IIX, and XVIIII. Scarce are the two Cohort pieces and all with epithets, plus XIIII and XVIII. Andrew says some of these are common, but that impression is probably merely created by the fact that they are particularly sought after and sell for a premium, so preferentially make their way into collections and are offered by dealers. Commonest are apparently II, V, VI, and XV. VI was the one Marcus and Verus chose to restore during their joint reign, doubtless in connection with a withdrawal and recoining operation. Probably that was the reason, its commonness, rather than any particular merit or imperial preference for that legion. In another display of my ignorance, I'm wondering if there is a reason behind those with named (epithets, as Mr. Clay described it) and those with only the LEG # at the bottom reverse? Is one an earlier version? Commonest are apparently II, V, VI, and XV. Very useful hoard list. As I noted I based my list just on RSC prices. Oddly RSC notes IIII as a "cheapie" - unlike XVIIII - so I didn't include it in my list of rarer coins. Happily I have an IIII in my collection. I indeed had the impression the cohorts and named legions were commoner as they always seem to be for sale albeit at lower condition and at their premium pricing. There's a commercial filter acting that brings them to the top. Several IIX are known, there was one at public auction about 5 years ago, I myself noted and bid on a different eBay example about 10 years ago (in the very early years of ebay), misdescribed as an IX but plainly not, the German ebay seller rejected my international bid (it was in the era before universally simple bank transfers) and it sold for 110 euros. Unfortunately I didn't grab a photo. I recall a third example cropped up too. Sounds vague, but I'm sure the type exists. My instinctive sense of the most common ones - II, V, VI, XV - is borne out by the hoard list, but I'd never seen them listed as such. X, XI, XII seem to crop up an awful lot in the market as does XVI. I wonder could an updated assessment be produced by analysing internet sales. Below is the "public auction" IIX I cited, NAC45, 2008. As it came via HjB to NAC I'm guessing Curtis may have handled it. It says "second known". As noted above I'm aware of a third example but without a record. As always thanks for all the excellent information. The seller of my coin indicated it was Legio Quarta, Macedonica, and was disbanded by Vespasian because of it's support of Vitellius in the Civil War. Is there a way to tell the difference between coins of Legio IV, Scythica, and Legio IV, Macedonica? In its first years, the whereabouts of IV Scythica are uncertain, although it is probable that it took part in Antony's campaign against the Parthians. The name suggests that it fought against the Scythians. After the battle of Actium and Antony's suicide, Octavian transferred IV Scythica to the Danube province of Moesia. The legion is reported to have taken part in civilian tasks, such as the building and keeping of roads. In his youth, future emperor Vespasian served in this legion. We have to be careful because some legions were disbanded or incorporated into Octavian's Legions after Actium. I have one of the scarcer VIIII Legion's as well, although not in great shape. Curtis, Andrew those are great lists, I've been looking for something like that. I wonder if it is possible to determine how many legionaries were in each legion by the amount of coins that survive. Not all of Antony's legions would have been at full strength. Then again after Actium many were discharged and settled throughout the provinces so it might be a stretch. There were two Legion IV. The scythica and the macedonica.The first levied by M.Antony,the second by Caesar ( always sided with Octavian). If you reviewed the Legion list that I linked to, you'll see that "Legion IV Scythica" was a legion of Mark Antony and "Legion IV Macedonia" was a legion of Octavian. I leave you to guess which of these legions the "Mark Antony Legion IV Denarius" commemorated! Thanks for the reference and image. On looking again, I find that I had already written this piece into my copy of Crawford on the authority of your reference to it on Forvm in July 2010! If you reviewed the Legion list that I linked to, you'll see that "Legion IV Scythica" was a legion of Mark Antony and "Legion IV Macedonia" was a legion of Octavian. I leave you to guess which of these legions the "Mark Antony Legion IV Denarius" commemorated! Ok, now I'm blushing, but at least I know the answer. I've been kicking myself for years about that eBay specimen. Firstly, by not offering the seller a knockout price (500 euros or so) via a note written in German language for the sake of allowing me to buy it, or at least bid on it. Secondly, by not taking a screen print of the coin. Computer speeds and my general dexterity with image handling was pretty basic at the time, maybe in 2002 or 2003. Perhaps I did save it to whatever ancient computer I owned at the time but I no longer have it. Weren't some of these legions never actually commanded by Antony himself, such as legions originally raised by Octavian? That is the only question I have about some of these Antony legionary denarii. I guess I have two questions actually. Was it then Antony's choice to pay the legions with this particular coin type? I guess I'm mainly asking what makes them "Antony's" legionary Denarii? I guess now after doing more reading, some legions I thought that were not commanded by Antony, were actually different legions with the same numbers. This is a very interesting discussion, as I also have an interest in legionary coinage, and their history. Lucas H, I hope you don't mind if I ask these question in this thread. My first question is related to the legions which were annihilated in the Varus campaign in northern germany in 9 A.D, the XVII, XVIII and XIX legions. Were these the same legions which fought under Marcus Antonius, and which later went on to be stationed in Germany? Also, to what extent can one consider that each legions coinage was used (exclusively?) by that one legion. I bought a Leg. 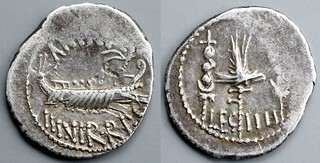 XIX denarius hoping to have a memento of one of the 3 legions lost by Varus, hoping that this would be the case. My second question is a simple one: Antonius Legionary denarii appear, as a whole, much more plentiful than those of Septimius Severus. Is this actually the case? There is a good description of Antony's legionary coinage in David Sear's 'The History and Coinage of the Roman Imperators 49-27 BC'. We have to remember that Antony and Octavian were at war. Octavian blocked Antony's ability to recruit soldiers from Italy even though he was legally entitled to do so. And of course he could not send to Rome for cash to pay his legions. He therefore had to mint his own, taking the opportunity to honour his legions and navy at the same time. Antony was camped in Greece at the time, so it is believed that his coinage was minted at his HQ at Patrae near the mouth of the Gulf of Corinth in 32 BC. Sear describes the volume of this coinage as 'truly prodigious'. Because it was somewhat de-based it was never removed from circulation for melting and consquently remained in circulation for two and a half centuries. After his defeat at Actium, some of Antony's legions were disbanded and some were incorporated into Octavian's legions. This gave rise to the name 'Gemini' (twin) for some legions. Excellent to know. Santa brought me Sear's History and Coinage of the Imperators for Christmas, but I have not started it yet. I swear I ordered it from Joe, but it never came even though the Forum showed it as shipped, but Santa had it all wrapped up under the tree on Christmas morning in the paper I swear I saw my wife using earlier in the month. Makes one wonder. Apparently I looked over the obvious! What started my line of questioning is when I was looking up different legions and didn't see any ties to Antony in them, but as I later saw, those were entirely different legions separate from the ones depicted on his coins. Some time ago Curtis Clay provided us with the following data for Antony's legionary denarii, which shows the quantities contained in the Delos Hoard of 1905, according to Revue Num. 2003. I recently eBayed a reasonable example (flat strike, but very clear number) of one of the real rarities: LEG IIII. IIII is a first-degree rarity, at the same level as PRI(?if exists), IIX ( 8 ) and XVIIII (19), all the others having odd-ball number formats. All these are also missing from RBW-NAC63. I've actually seen two examples of IIX (one on eBay, pre-euro, from a German seller, who rejected my bid as I did not have a DM account). I have never seen an example of XVIIII for sale. IIX not in Crawford, none in hoard. Has anyone seen other examples of PRI, IIII, IIX, XVIIII? Page created in 1.764 seconds with 69 queries.